History was made Tuesday with the grand opening of the very first recreational marijuana storefront on the East Coast. It has been a long time coming, voters legalized non-medical cannabis two years ago. Kickoff starts around 8:00 am for Medical marijuana facilities, Cultivate Holdings, in Leicester, and New England Treatment Access (NETA). In Northampton the state’s first, legal recreational marijuana sales to people over the age of 21. The mayor who is a U.S. military veteran became the first customer to ignite the green era. Massachusetts first won the legalization vote back in 2012 and then voted to be legalized to recreational use in 2016. Mayor David Narwekwicz, who served in the Air Force said to the reporters this morning that he made a “statement” purchase of cannabis-infused chocolate bar, which he would save rather than consume for historic reasons. He purchased the marijuana candy bar at NETA. “My plan actually will be to preserve it and display it because it will be a historic purchase here in the city,” he said. Leicester has a population of nearly 10,500 people, and Northampton’s population is more than 28,500 according to the 2010 census. NETA’s director of organizational compliance, Amanda Rositano, said during a Monday news conference with the mayor that the business was still in the process of prioritizing its medical marijuana patients despite the recreational sales and would be working to educate customers about marijuana laws and regulations for consumption. Many business owners in the surrounding buildings have welcomed the shops in hopes of boosting sales in their own stores. Mitch Rosenfield one of the owners of a nearby store called The Hempest, which sells Hemp, CBD products and smoking accessories says he has been waiting and promoting the opening of these stores. He noted that “we’ve missed out on a lot of tax revenue” with the delay. However, he is happy the state took its time to solidify everything before opening. 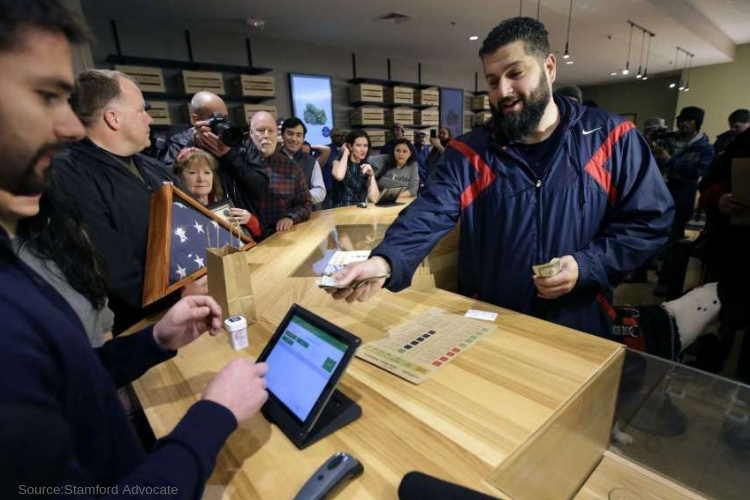 His store was a huge contributor in fundraising and driving signatures in support of legalizing marijuana. Just like in California Massachusetts pot shops will be limited in how much they can sell to a single buyer and both public consumption and driving under the influence of marijuana is still illegal. Marijuana has been legalized almost nationwide with 10 states including Washington D.C. have legalized marijuana for recreational use, while only 33 three states allow it for medical. Just like most states, Massachusetts would require a multi-step application process with intense background checks and inspections to make sure new businesses would be safe and compliant with the law.